When it comes to seafood, my husband can have a bottomless stomach. He loves it. A lot. Maybe too much! So when I was planning my Tuscan Grill Party menu, I wanted to make sure seafood was represented. Being that shrimp is his favorite seafood and that it was easy to cook on the grill, I added that to my menu. I also scored some lobster tails on sale at the store and figured I'd use that some how. 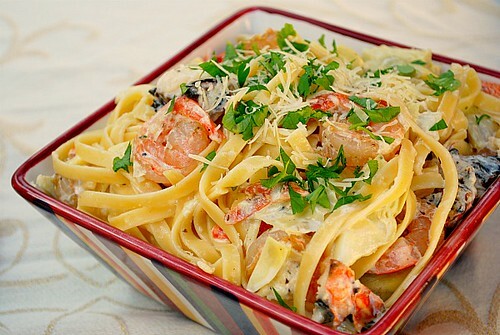 I ended up bringing together shrimp, lobster and pasta to create this Grilled Shrimp & Lobster Artichoke Fettuccine Alfredo that really was a popular menu item on the table. Fire roasted shrimp and chunks of lobster tail are tossed with marinated artichokes in a buttery, creamy alfredo sauce and fettuccini noodles for a rich pasta dish! I really didn't plan on having a heavy or rich pasta dish for my Tuscan menu. It seems a bit like the black sheep of the menu because the other dishes were light. But little did I know how everyone would have devoured it! There were no leftovers (sadly) but I was glad it was a definite hit. Since lobster was on sale, it was added to the dish on a whim but it can certainly be omitted altogether. Or, if you want, substitute scallops for the lobster. Bring a large pot of water to a boil. Cook the fettuccine, al dente, according to the package directions. Meanwhile, grill shrimp until cooked through. In a skillet, add about a tablespoon of olive oil. Add the chopped shallot and garlic, cooking until slightly softened, about 3-4 minutes. Add the artichokes and sauté until warmed through. Add the cream and the zest of 1 lemon. Bring to a gentle simmer, stirring constantly. Add shrimp and cooked lobster to the sauce for a few seconds to reheat. Toss the fettuccine in the sauce and serve immediately. You've captured my Nova Scotian heart with this dish! So amazing! Looks great! I plan to try it next week for a dinner party. How many does this serve? How many ounces was your box of fettucine?